" I enjoyed my first encounter with your business and found your candidates and service excellent. Thanks a lot! " " We offered the position to the 2nd candidate put forward. Easy Peasy and took less than 2 weeks! " " Thank you very much. Your company has been a real pleasure to work with. I have given your name to quite a few people and sung your praises. " " A big thank you to RecruitMyMom for bringing the opportunity to me in the first place. This company is a wonderful family driven team and I feel very privileged to be working with them. Best of all they 100% get the mom side of things and I don’t think I would have found such an understanding client without RecruitMyMom. I have been driving all of my mom friends to your platform, as I have been so impressed with your client service, as well the quality of client that you put me in touch with. " " Wow, no wonder you guys won the award for job creator of the year. Thank you very much for the names (candidates). " " RMM, has been very much part of my own self discovery. The fact that I have had three interviews with your help, proves to me you are one in a million. " " Rachille is already an integral part of the team and feels like she always has been! She mentioned recently that she has never been happier in a job. Thanks again for the role you and your team played. " " I would like to take this time to thank you for assisting me on finding the job I have prayed for. Thank you for contacting me the minute I applied for the position of half day financial manager. You have walked the journey with me from the time I have applied until the offer of employment was signed and for that I am tremendously grateful. This position suits my current lifestyle with my three young kids due the flexibility around this role. I truly feel that I have discovered the best of both worlds. " " I love working with RecruitMyMom, they are always friendly and deliver first-rate candidates for interviews. " " The RecruitMyMom team were amazing on all levels, shared relevant information, details were all accurate and made me feel very special when I secured the position with the client. Really just hassle free and so pleasant to deal with your office at any time. Congratulations on an incredible operation and the great staff you have on board. " RecruitMyMom is a trusted online recruitment company based in South Africa. We match forward-thinking companies to skilled women looking for meaningful part-time and flexible employment. We empower women to have a greater quality of life by assisting them to find meaningful employment with varying degrees of flexibility or part-time hours. We solve employers resource needs through collaboration and problem-solving engagement. To achieve this purpose we offer an easy to use, professional online service. 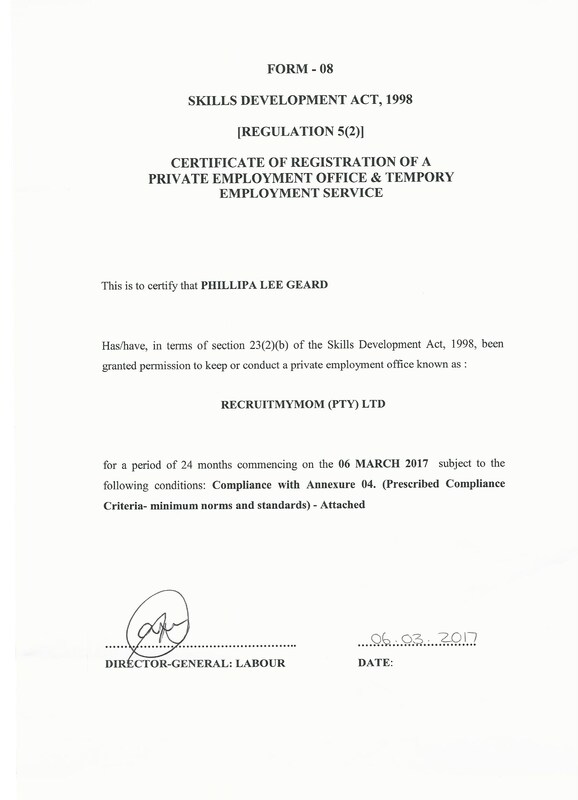 We offer a people mediated personalised service and support to both employers and job-seekers. RecruitMyMom was founded in 2012 by passionate initiator Phillipa Geard, founder and CEO, based in South Africa. Phillipa, a mother of two, was inspired by the talents and abilities of many skilled mothers who are a great asset in business provided they are given the environment and flexibility they require. Rather than lose these skills, RecruitMyMom seeks to find a solution to retaining these skills for forward-thinking companies. Today the community consists of over 50 000 skilled Moms (and other career-flex workers) seeking meaningful employment opportunities together with thousands of forward-thinking employers. RecruitMyMom has been listed as one of the 25 most successful business ideas in South Africa by Entrepreneur Magazine. Phillipa is backed by a team of professionals who assist her in the business, all of whom work virtually from home-based offices. 2014 - Nominated for an emerging entrepreneur award by the Business Women’s Association of South Africa.